Here @ Go Electric we have a wide range of high-quality electric bicycles and scooters for sale. We are national distributors for a variety of internationally branded electric bikes. If you don't see what you're looking for here, let us know and we can also source high end electric bikes for you or at least offer some advice. Electric Bikes allow you to go farther and faster and are also a much safer option! Electric bicycles take the strain out of cycling- flattening hills and helping you glide through headwinds. They give you peace of mind, knowing that you have the motor to assist you when you need a little push. "Sorry we don't sell cheap electric bikes- we only sell quality Euorpean brands with superior branded batteries!" Look for a second- hand good quality electric bike before buying a cheap one brand new- you get what you pay for! The A2B range is a high-end range of sturdy electric bikes introducing real quality into the e-bike sector. While most other manufacturers are bolting motors onto regular bicycles, A2B started from scratch and set out to be an amazing electric bike. The A2B range currently consists of the Hybrids 24" and 26", and the Metro Scooter. 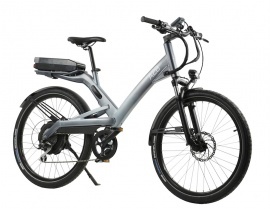 The Hybrids are our top of the range 'Pedelec's, the Metro is a 'twist and go',while the Metro sits somewhere in between with pedals and 'twist and go'- designed to give you a boost when you need it. Full range of A2B range of electric bikes and to pre-order the , please click here. Technically, we don't do second-hand electric bikes but from time to time, we do sell off our own demo electric bikes at discounted prices throughout the year. If you're interested in keeping up to date with our latest discounted electric bikes, feel free to joint our Newsletter List and also check our Clearance Section.